It might be brilliant, but is it canon? This year's Brilliant Book (or next year's, depending on how you look at it) follows on from its predecessor by including a number of features expanding series six's stories as seen on screen. Tom MacRae writes about different colours of Handbot (topaz, avocado, or classic white); Mark Gatiss pens diary entries from young George (revealing the doll's house in his cupboard belonged to his mum); and Neil Gaiman unveils eleven things about the Corsair (including how her seventh incarnation allegedly dealt with Daleks on Clarkor Nine). Stephen Thompson elaborates on Henry Avery's adventures, while Matthew Graham's take on Gangers' rights involves a rather unusual birthday party. These features are a lot of fun, although casting an eye over the list of contributors does reveal a few notable absences. Busy writing the 2011 Christmas Special as this book neared its deadline, Steven Moffat doesn't proffer any additional material based around his five episodes, with those writing duties instead falling to the likes of Rupert Laight, David Llewellyn, Jason Arnopp, and James Goss. It's Arnopp who fills in what happened to the Doctor, Amy, Rory and River in the missing three months between The Impossible Astronaut and Day of the Moon, and Goss who fleshes out Madame Vastra's story. Although these are all interesting, witty pieces, it's still a shame that Moffat's distinctive writer's voice is lost from the “extras” elaborating on his stories. Toby Whithouse is likewise absent from story extensions of his ep, though he does reveal that the Doctor's "god complex", discussed in Rita's dialogue, wasn't originally planned as a thematic development of the episode title (p.129). The biggest absence, though, is that there are no teasers/spoilers included, unlike last year's infamous Dream Lord featurette. Presumably the fact that series seven's filming is later than usual has meant that scripts are not sufficiently locked-down to allow for such things. Or perhaps the production team doesn't want to license fans' spoiler speculation this year? Whatever the reason, this gap is a real pity: last year's mixture of real and fake spoilers generated much online debate. Indeed, this Brilliant Book is extremely proud of 2011's spoilers, repeatedly telling readers that it featured the first appearance of “the only water in the forest is the river”. This is mentioned in the section for The Doctor's Wife (p.59), and referred to again in relation to A Good Man Goes To War (p.86). Wouldn't one mention have been enough? (Or does this count as editorial lobbying for the return of a teaser/spoiler feature next time?). We also learn that one of the Dream Lord's teasers actually inspired The Wedding of River Song, with “502 but never 503” being a fake spoiler from Gareth Roberts... until Steven Moffat read it, liked it, and worked it into his ep 13 script (see p.148). That's genuine dedication for you: a showrunner who deliberately deconstructs the line between true and false spoilers in an official tie-in publication. Each story from The Christmas Carol to The Wedding of River Song is covered here via a number of regular features. Lee Johnson's full-page illustrations are simply stunning, with the contrast between his Rebel Flesh and Almost People pages being especially striking, whilst his compositions for The Doctor's Wife and The Wedding of River Song are also stand-out artworks. Through no fault of his own, though, David Bailey's story synopses feel like fourteen pages of filler. They are always elegantly written, but are nevertheless slightly coy about revealing episode endings – will anyone reading this book not have seen the relevant TV episodes? – and they don't really “add value” in the way that most other contents do. The “Where Have I Seen?” sidebars about guest stars also won't be of much worth to dedicated fans. And the feature has to be valiantly stretched to cover The Girl Who Waited, where we 'learn' about guest star Karen Gillan. Perhaps dropping this for one story would have been reasonable, but editor Clayton Hickman opts for consistency and (comedic) completism over common sense. That's genuine fandom for you: an editor who deliberately deconstructs the line between regulars and guest stars in an official tie-in publication. A few features are written from the Doctor's perspective, including a hilarious job application to Sanderson & Grainger penned by Roberts and Hickman. This plays with next year's story possibilities by stressing that the Doctor is now officially and historically “dead”, meaning that his presence (in this very title) shouldn't be publicised. And another highlight is Mark Gatiss's return to writing for Simon Callow's Charles Dickens, as we discover how Dickens makes use of Twitter when time freezes at 5:02pm. These, along with Gaiman's "Planet of the Rain Gods" comic strip, are fixed points of greatness in this fine tome. There's also a smattering of behind-the-scenes material, much of which focuses on monster-making or on interviewing the series regulars. The non-fiction side of things sometimes feels like a mash-up of Doctor Who Magazine and Doctor Who Confidential. Perhaps if the latter isn't restored to BBC Three then its brand could be continued in hardback annual form? But a wider mix of non-fiction material would also be welcome; Jason Arnopp's interview with director Toby Haynes strikes an unusual note by diverging from writer/actor/Neill Gorton quotes. There's very little Executive Producer presence here, for instance: couldn't the Brilliant Book have tracked down Beth Willis or Piers Wenger for a 'Brilliant Look Back at their Brilliant Memories of the Show'? Instead, silence falls somewhat when the question of exec-production is asked. 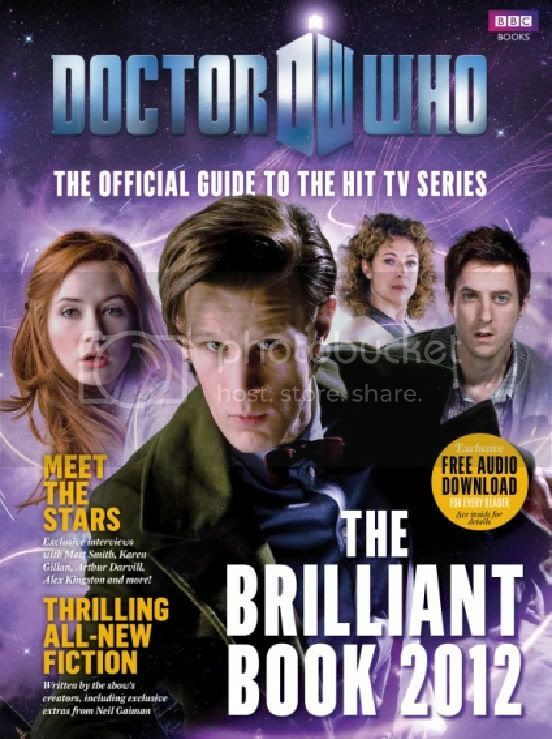 Brilliant Book 2012: And finally: Doctor who? Care to give us any clues? Steven Moffat: No. [The interview sidebar ends]. You can almost imagine the Digital Spy headline now: “Showrunner Says No Clue on Who”. In fact, Digital Spy is itself gently lampooned across the pages following Moffat's terse negative, where James Goss entertains by creating some Ceefax-style “Analogue Spy” stories. This feature, in particular, blends great design with sparkling content, but it should be said that one of the consistent strengths of the Brilliant Book 2012 – as last year – lies in its beautiful design, layout, and illustrations. Although the range of non-fiction doesn't quite satisfy, and in an ideal world it'd be good to have all the TV writers contributing new fiction (as well as a proper section of series seven spoilers), this volume remains a highlight of the Doctor Who publishing calendar, despite only being in its second year. Whether or not its fiction is strictly canonical, The Brilliant Book 2012 is often informative, sometimes educational, and always entertaining.